Josh and I recently felt like we were spending a lot of our time simply tag-teaming it rather than being together, which made us really sad! 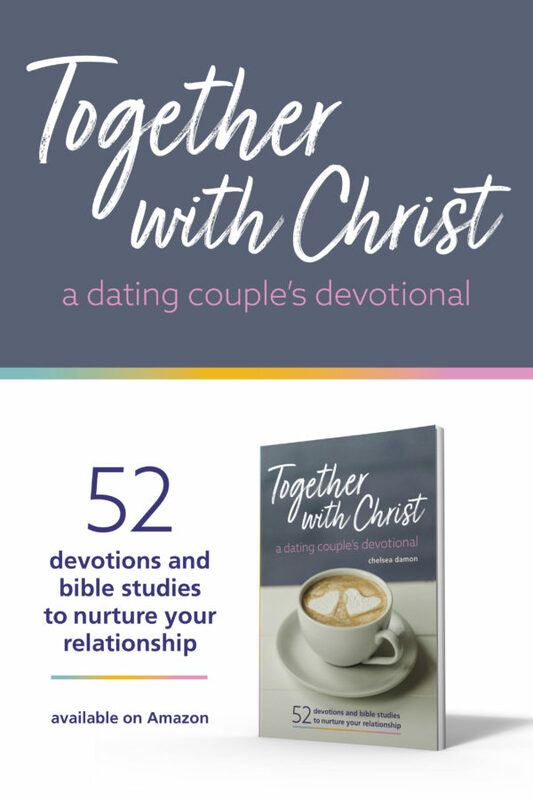 Of course, different stages of life will require more from each of us from time to time, but we wanted to make a few changes in order to be able to spend more time together. So, instead of our usual habit of going to the gym individually and trading off watching the kids, we decided to switch things up! We got a family gym membership that provides child care and we also decided to do way more home workouts together! 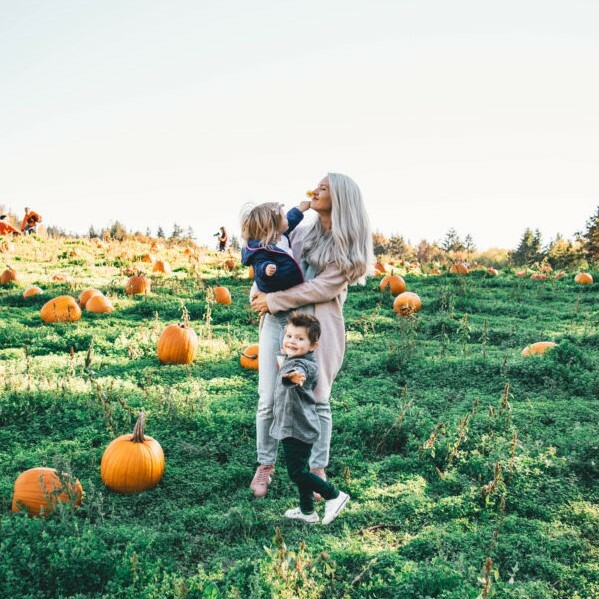 When I shared this on Instagram, a lot of you said that you and your husband are caught in the same tag-teaming cycle and want to have more quality time together! 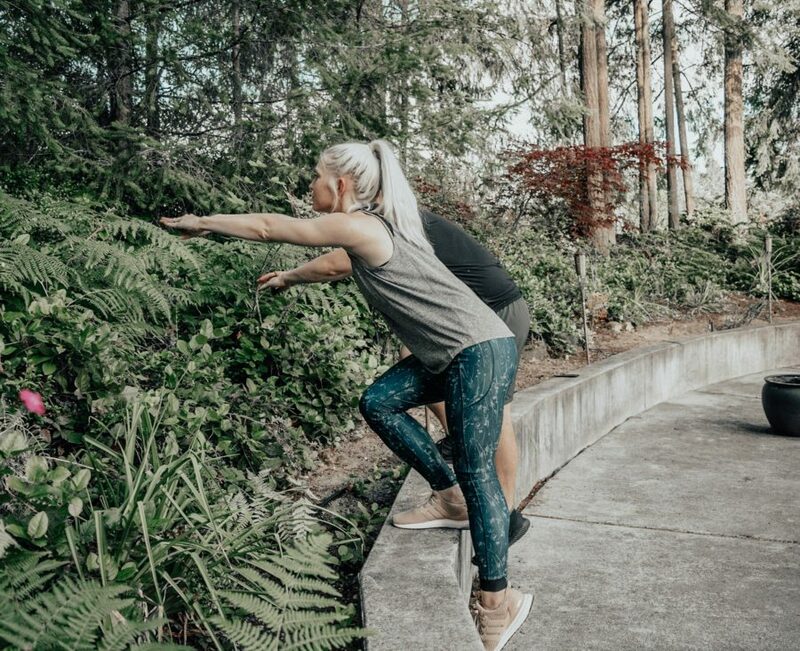 That being the case, Josh and I put together a couple workouts that husbands and wives can do together! 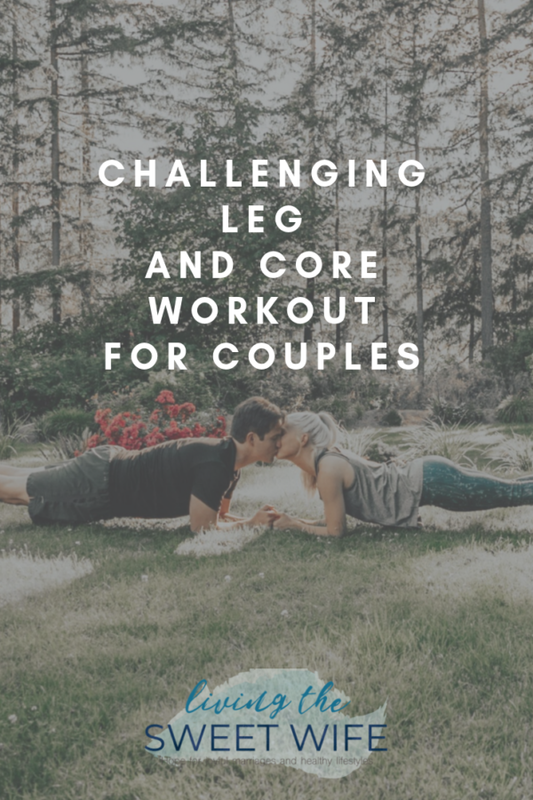 You could say, they’re a couple of couples workouts…. This workout focuses on legs and core, all while getting some great cardio in depending on how quickly you move from one exercise to the other. 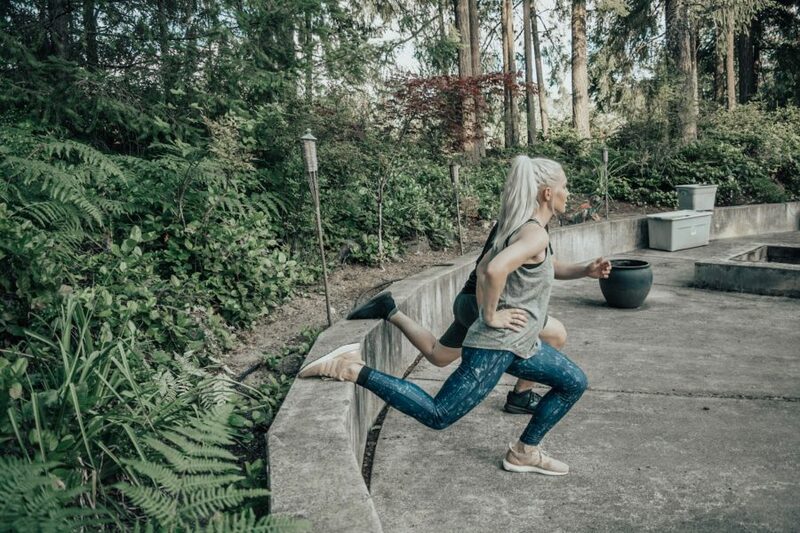 Let’s start with backward lunges. One of my all-time FAVORITE workouts! Simply find a step or ledge that is 2-3 feet off the ground. Keep one foot planted on the ledge and the other straight. Then, bend your planted leg at the knee like you’re doing a lunge, then come up again and straighten your leg. Do this at least 10 times for each leg. I find it helps to hold my hands in front of me to keep balance. Next, is the jump squat except instead of jumping in place, will be jumping on to that same ledge! Start with both feet planted on the ground and shoulder width apart. Then, jump up to the ledge keeping both feet the same height while you jump. Once you’re up on the ledge, straighten up into a standing position. Do 10 to 12 reps of this! Next we have another version of a jump squat except this time it will be jumping as far as we can forward! All you have to do is start in a squatted position, ready to jump. Then, in one movement thrust yourself forward as far as you can go, doing your best to keep your feet at the same distance. Next we have a classic, the lunge. 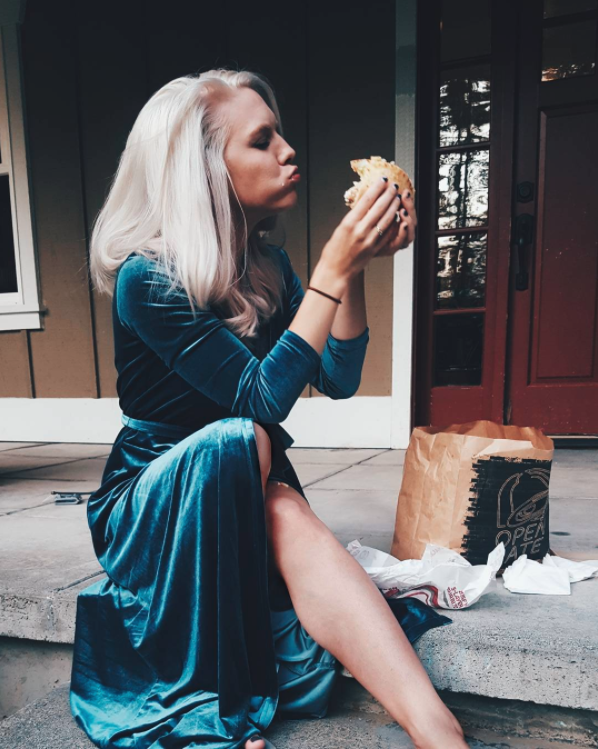 this is one of my favorites because it gets both my buns & thighs at the same time! If you can, find an area with lots of room. Take a step as if you’re walking but bring one knee all the way to the ground. Then come up as if you’re taking another step and bring the other knee all the way to the ground. See if you can get 20 of these in! This is another workout I feel every single time! It’s called the Bulgarian split squat. Similar to the backward lunge, we’re only using one leg at a time, except one foot will be up on that ledge and the other will be planted on the ground. Be careful to keep your balance! With your one leg, go down into a lunge position, bending at the knee and then jump straight up, all while keeping your foot planted on the ledge. Try to do this 10 times for each leg! Next, we’re moving on to some abs! This core workout is killer but so worth it! Lay on the ground with your legs up in the air and your partner standing over your head. Hold on to your partner’s ankles and have them grab your feet. Next, they’ll throw your feet forwards and you need to gain control of the movement and bring your feet slowly to the ground. Then lift them back up and repeat several more times! And last but not least is the classic plank! 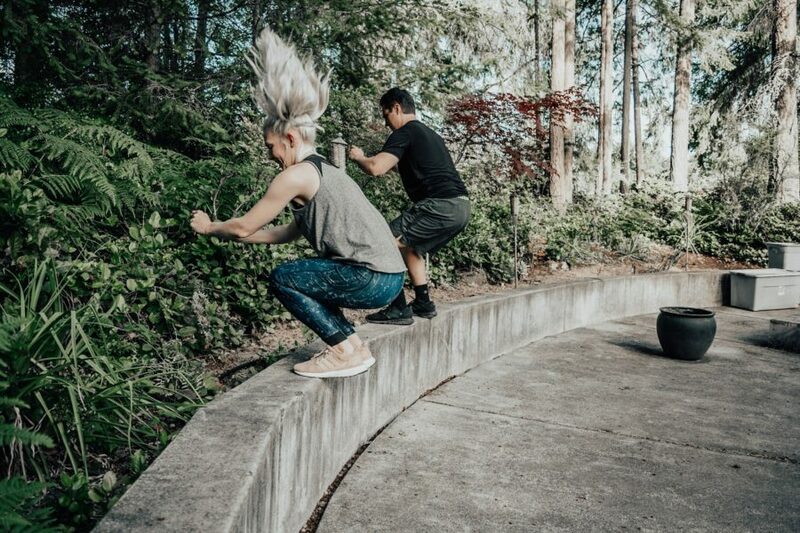 Josh and I love to do this while yelling at each other to keep our core tight and our backs up! Try to create a little healthy competition between you and your partner to see who can hold their plank the longest! When Josh and I started working out together, it was like a magic wardrobe into a whole new world of our relationship! 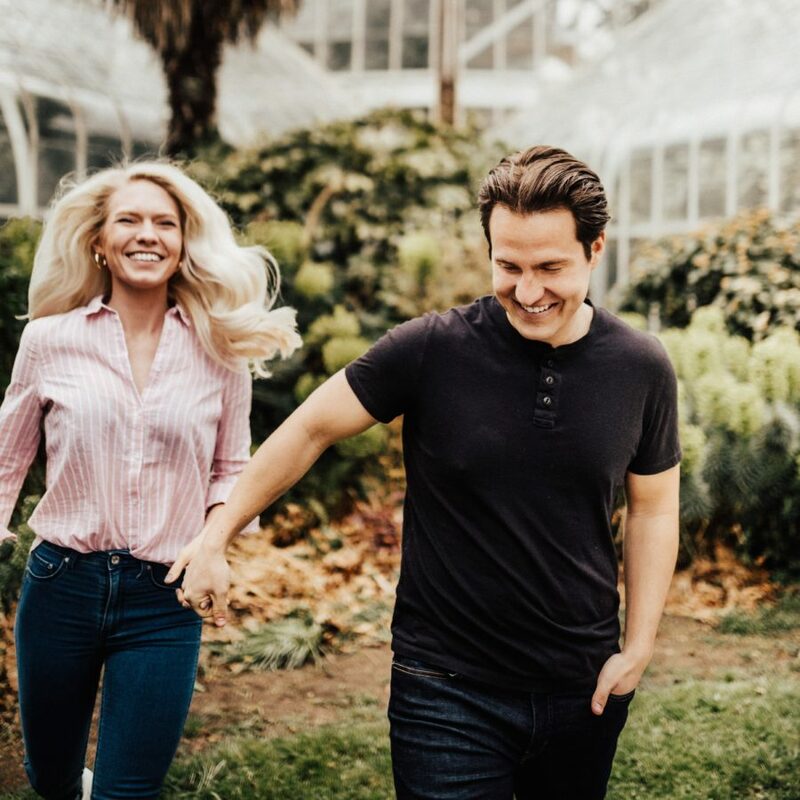 I never realized what a big part of our relationship it would be and how much I would love sharing health and fitness goals with him! not only that, but we had a new hobby that we both loved and could do together! It also helped to make us more comfortable talking about things related to our health. Last month, I realized I had a UTI and the pain was really getting to me. While an older version of myself might have been embarrassed to bring it up, this time around, it was no big deal! Of course I had a lot of help from AZO Urinary Pain Relief making it so much easier for me to get on with my day than being slowed down by the pain from my UTI. And since it was available at Target in the feminine hygiene aisle, I just picked it up while I was doing the rest of our grocery shopping for the week! A real no-brainer! 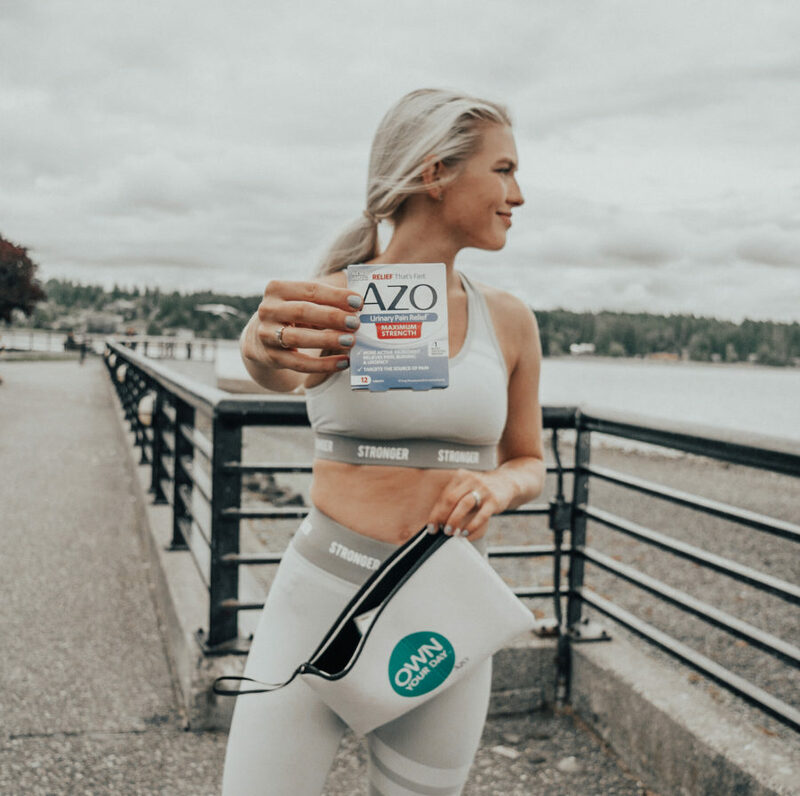 If you’re experiencing UTI symptoms, try AZO Urinary Pain Relief to keep your days moving like they should! #OwnYourDay This product is also available at all major retailers and online at Amazon. This looks like such a fun wOrkout! My husband and I have been doung the tag-teaming thung lately. This looks like something we could do together at home! The ab move is one of my favorites. 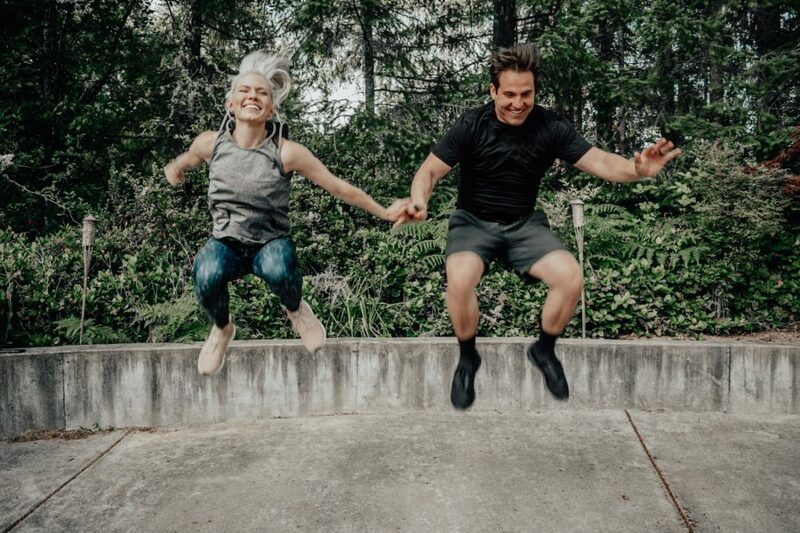 I love working out with my husband. We’re going to try this. Thanks. 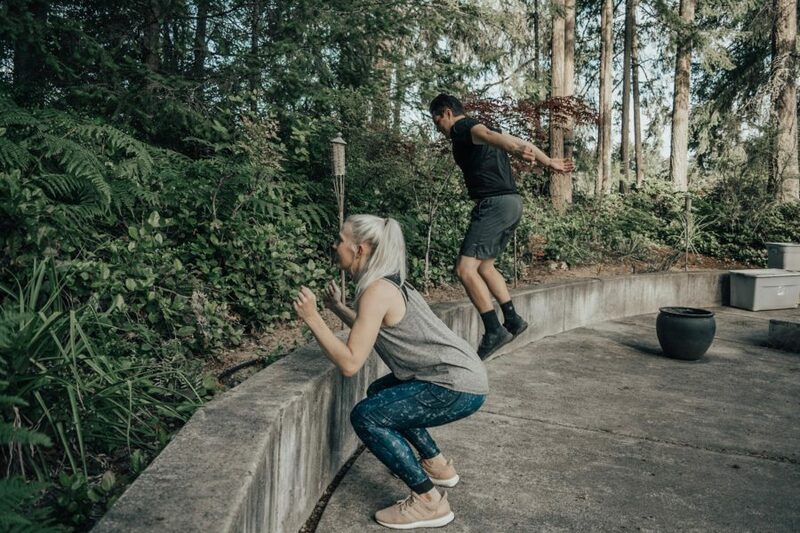 Couple workouts are the best! 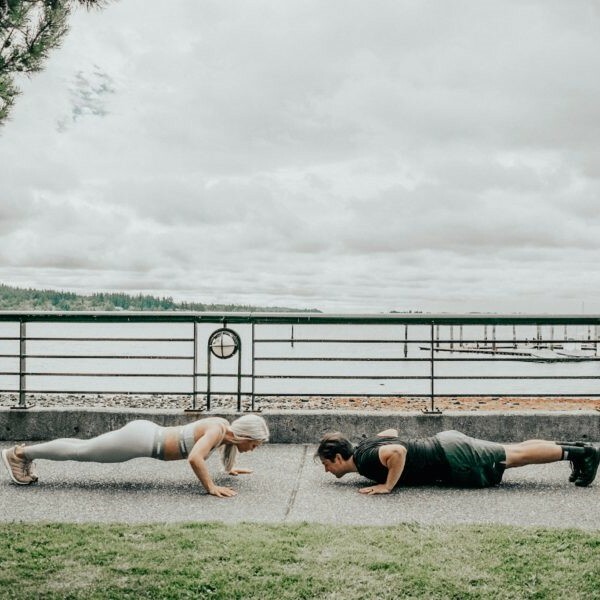 My husband and I love working out together when we can and the next time we do I will definitely add kissing planks to the routine.